If you have included your mobile phone number in your Facebook contact information, then you’ll be interested in a major security flaw discovered by Suriya Prakash. In a perfect world, my phone number would be safe from hackers, scammers and other prying eyes on Facebook, but that is not the case. There is a sneaky, conflicting privacy setting that overrides this one. Even more worrisome is the fact that Prakash was able to write and execute a script to collect usernames and phone numbers of random Facebook members. He estimated that a hacker could use a botnet to obtain the data of all affected accounts in only a couple of days. Prakash notified Facebook about the flaw, and it appears Facebook didn’t fully comprehend the issue. They further stated that it was the user’s responsibility to make sure they couldn’t be found based on their phone number provided. Facebook also claimed the attack wasn’t a serious threat because ‘rate limiting’ controls are in place to impede a hacker’s efforts. Surprisingly, Prakash bypassed the rate limiting measure by simply using the mobile version of Facebook. Prakash claims he has reached out to Facebook five times on this issue, and they refuse to fix or even acknowledge the bug, so he decided to go public with his findings. Prakash believes that up to 500 million users could be affected by this vulnerability. Until Facebook appropriately corrects this issue by adding the ‘Only Me’ option in the privacy settings, users are encouraged to set the option to ‘Friends.’ You could also bypass the extra layer of security provided by login approvals and remove your mobile number altogether. *Update 11-OCT-12 – Allfacebook is reporting that Facebook has fixed the vulnerability that allowed phone numbers to be easily harvested from Facebook. We still contend that the issue isn’t appropriately addressed until users have the option to totally restrict who can look them up via their mobile number. 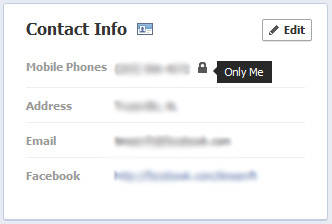 As reported earlier this week, there is not an ‘Only Me’ for this privacy setting.